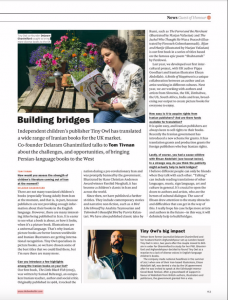 Tiny Owl illustrator Ehsan Abdollahi has celebrated his recent visit to the UK by illustrating The Bookseller‘s editorial front cover for the August issue. 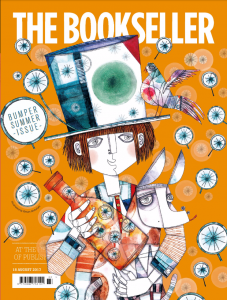 The cover features Pim, the main character from A Bottle of Happiness and plentiful dandelions, a symbol of happiness in Persian culture. The result is a wonderful splash of colour bringing messages of hope and happiness to the publishing world. Tiny Owl are very grateful for all of the support for Ehsan’s case and are thrilled that other artists, such as Avner Pariat, whose visas have been refused are also beginning to see these decisions overturned. Tiny Owl was initially set up in response to the lack of children’s books that reflected the culture of its co-founder Delaram Ghanimifard. She wanted her sons to experience stories from home and appreciate the beautiful and diverse artistic heritage of Iran. Since 2015, Tiny Owl has published 16 books that celebrate the rich literary heritage of Persian culture and its collaboration with contemporary artists from Iran showcases the diverse illustrative styles coming from the region. As Tiny Owl spreads its wings, its aim is to continue to broaden perspectives and celebrate marginalised voices through publishing books from around the world as well as working on intercultural book projects such as A Bottle of Happiness.